"Trappist" redirects here. For other uses, see Trappist (disambiguation). 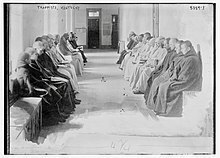 The Trappists, officially the Order of Cistercians of the Strict Observance (Latin: Ordo Cisterciensis Strictioris Observantiae, abbreviated as OCSO), are a Catholic religious order of cloistered monastics that branched off from the Cistercians. They follow the Rule of Saint Benedict and have communities of both monks and nuns that are referred to as Trappists and Trappistines, respectively. They are named after La Trappe Abbey, the monastery from which the movement and religious order originated. The order takes its name from La Trappe Abbey or La Grande Trappe, located in the French province of Normandy, where the reform movement began. Armand Jean le Bouthillier de Rancé, originally the commendatory abbot of La Trappe, led the reform. As commendatory abbot, de Rancé was a layman who obtained income from the monastery but was not a professed monk and otherwise had no religious obligations. He possessed considerable wealth and was earmarked for an ecclesiastical career as coadjutor bishop to the Archbishop of Tours. 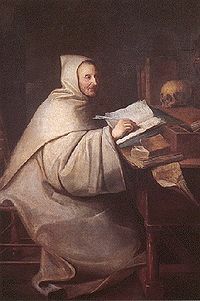 However, after undergoing a conversion of life between 1660 and 1662, de Rancé renounced his possessions, formally joined the abbey, and became its regular abbot in 1663. In 1664, in reaction to the relaxation of practices in many Cistercian monasteries, de Rancé introduced an austere reform. de Rancé's reform was first and foremost centered on penitence; it prescribed hard manual labour, silence, a meagre diet, isolation from the world, and renunciation of most studies. The hard labour was in part a penitential exercise, in part a way of keeping the monastery self-supportive so that communication with the world might be kept at a minimum. This movement spread to many other Cistercian monasteries, which took up de Rancé's reforms. In time, these monasteries also spread and created new foundations of their own. These monasteries called themselves "Trappist" in reference to La Trappe, the source and origin of their reforms. In 1892, several congregations of Trappists left the Cistercian order and reformed a new order with the approval of Pope Leo XIII, formalising their identity and spirituality as a separate monastic order. One of the most notable Trappist theologians was Thomas Merton, a prominent author in the mystic tradition and a noted poet and social and literary critic. He entered the Abbey of Gethsemani in 1941 where his writings and letters to world leaders became some of the most widely read spiritual and social works of the 20th century. Merton's widely-read works include his autobiography, The Seven Storey Mountain, as well as New Seeds of Contemplation and No Man is an Island. The first Trappist saint was Saint Rafael Arnáiz Barón, who was a conventual oblate of the Abbey of San Isidro de Dueñas in Dueñas, Palencia. His defining characteristic was his intense devotion to a religious life and personal piety despite the setbacks of his affliction with diabetes mellitus. He died in 1938 aged 27 from complications of diabetes, and was beatified in 1992 by Pope John Paul II and canonised in 2009 by Pope Benedict XVI. Monks of the Abbey of Our Lady of Gethsemani in the early 20th century. Trappists, like the Benedictines and Cistercians from whom they originate, follow the Rule of Saint Benedict. "Strict Observance" refers to the Trappists' goal of following the Rule closely. They take the three vows described in the Rule (c. 58): stability, fidelity to monastic life, and obedience. Trappist monks in Pertapaan Rawaseneng, Indonesia, praying Terce. Saint Benedict's precept to minimise conversation means that Trappists generally speak only when necessary; thus idle talk is strongly discouraged. However, contrary to popular belief, they do not take a vow of silence. According to Saint Benedict, speech disturbs a disciple's quietude and receptivity, and may tempt one to exercise one's own will instead of the will of God. Speech that leads to unkind amusement or laughter is considered evil and is forbidden. A Trappist sign language, one of several monastic sign languages, was developed to render speaking unnecessary. Meals are usually taken in contemplative silence as Trappists listen to a reading. Unlike the Benedictines and Cistercians, Trappists fully abstain from meat as regards "four-footed animals". They generally live as vegetarians, with their diet mostly consisting of vegetables, beans, and grain products, but they may sometimes eat fish. A Trappist novice reading in his desk. A Trappist novice kneeling at the cross. Candidate/observership: candidates or observers visit a monastery and consult the vocation director and/or the superior to help them discern their vocation. Usually they will be asked to live in the monastery for a short period of time, at least one month. Postulancy: candidates live as a member of the monastery as a postulant for some months, they are guided by the novice director. Novitiate: postulants will be clothed with the monastic habit and are formally received as a member of this order. Novices are still guided by the novice director, and they undergo this stage for two years. After novitiate, novices may take temporary vows. They will live this stage for three to nine years to deepen study, practicing the Gospel in the monastic way and integration within the society. After finishing the previous stage, the professed members may take final vows for their entire life. The 48th chapter of the Rule of St. Benedict states "for then are they monks in truth, if they live by the work of their hands". Following this rule, most Trappist monasteries produce goods that are sold to provide income for the monastery. The goods produced range from cheeses, bread and other foodstuffs to clothing and coffins, though they are most famous for Trappist beers, which are unique within the beer world, and are lauded for their high quality and flavour. Monasteries in Belgium and the Netherlands, such as La Trappe, Orval Abbey and Westvleteren Abbey, brew beer both for the monks themselves and for sale to the general public. Trappist beers contain residual sugars and living yeast, and, unlike conventional beers, will improve with age. Westvleteren 12 is often considered to be the single best beer in the world. The Trappist monks of the Tre Fontane Abbey raise the lambs whose wool is used to make the pallia of new metropolitan archbishops. The pope blesses the pallia on the Feast of Saints Peter and Paul; the metropolitan archbishops receive those pallia in a separate ceremony within their home dioceses from the hands of the Apostolic Nuncio, who personally represents the pope in their respective countries. The monks of New Melleray Abbey in rural Peosta, Iowa produce caskets for both themselves and sale to the public. St. Joseph's Abbey in the town of Spencer, Massachusetts produces the first Trappist beer of the United States. It is named the Spencer Brewery in the Trappist tradition for the town in which it operates. Cistercian College, Roscrea, a boys' boarding secondary/high school in Ireland, is the only Trappist school left in the world, and one of only two remaining monastic secondary schools in Ireland. Cistercian monasteries have continued to spread, with many founded outside Europe in the 20th century. In particular, the number of Trappist monasteries throughout the world has more than doubled over the past 60 years: from 82 in 1940 to 127 in 1970, and 169 at the beginning of the 21st century. In 1940, there were six Trappist monasteries in Asia and the Pacific, only one Trappist monastery in Africa, and none in Latin America. Now there are 13 in Central and South America, 17 in Africa, and 23 in Asia and the Pacific. In general, these communities are growing faster than those in other parts of the world. Over the same period, the total number of monks and nuns in the Order decreased by about 15%. There are on average 25 members per community – less than half those in former times. As of 1 January 2018[update], there were 1,796 Trappist monks and 1,592 Trappistine nuns across the world. Sébastien Wyart, 1st Abbot General of the Trappists between 1892–1904. The Abbot General and his Council reside in Rome and are generally in charge of the Order's affairs. The present Abbot General is Dom Eamon Fitzgerald of Mount Melleray Abbey in Waterford, Ireland. Every three years, the abbots and abbesses of each branch meet at the Mixed General Meeting, chaired by the Abbot General, to make decisions concerning the welfare of the Order. As of 2018[update], there were 168 Trappist monasteries and convents. Abbey of Our Lady of the Holy Trinity in Huntsville, Utah, United States. Closed down August 2017. ^ "CATHOLIC ENCYCLOPEDIA: Jean-Armand Le Bouthillier de Rance". Newadvent.org. 1911-06-01. Retrieved 2011-03-09. ^ M. Basil Pennington, OCSO. "The Cistercians: An Introductory History". The Order of Saint Benedict. Retrieved 2008-01-01. ^ OCist.Hu - A Ciszterci Rend Zirci Apátsága (2002-12-31). "History". OCist.Hu. Retrieved 2011-03-09. ^ "OSB. Rule of Benedict : Text, English, Jan May Sep 3/3". Osb.org. 2006-05-06. Retrieved 2011-03-09. 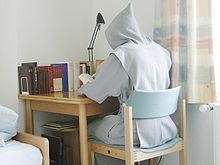 ^ "A Newcomer's Guide to the Trappists | Becoming a Trappist Monk or Nun". www.trappists.org. Retrieved 2017-06-19. ^ "The Rule of St. Benedict". Ccel.org. Retrieved 2011-03-09. ^ "The Best Beer in the World". 99% Invisible. Retrieved 8 October 2015. ^ Bryce Eddings. "What are Trappist beers?". About.com Food. Retrieved 8 October 2015. ^ "TRAPPIST - THE SEVEN MAGNIFICENT BEERS". BelgianShop Online. Retrieved 8 October 2015. ^ "Michael Jackson's Beer Hunter - Chastity, poverty and a pint". Beerhunter.com. Retrieved 2011-03-09. ^ "A Sign From Above? Needing New Roof, Monks Sell Rare Beer In U.S." The Huffington Post. 12 December 2012. Retrieved 21 December 2012. ^ a b c d e f "Cistercian Order of the Strict Observance (Trappists): Frequently Asked Questions". Ocso.org. 2003-12-08. Archived from the original on September 17, 2009. Retrieved 2010-01-18. ^ STATISTIQUES Moines - Monks - Monjes (PDF). ocso.org (Report). Order of Cistercians of Strict Observance. 1 January 2018. Retrieved 12 October 2018. ^ STATISTIQUES Moniales - Nuns - Monjas (PDF). ocso.org (Report). Order of Cistercians of Strict Observance. 1 January 2018. Retrieved 12 October 2018. ^ a b c "Abbey of Our Lady of the Holy Trinity: Brief History". Holytrinityabbey.org. Retrieved 2010-01-18. ^ "Alphabetical List : Order of Cistercians of the Strict Observance : OCSO". ocso.org. Order of Cistercians of the Strict Observance. Retrieved 13 October 2018. ^ a b "The World Is Changing. This Trappist Abbey Isn't. Can It Last?". nytimes.com. ^ RadioWest (3 October 2017). "To Close A Monastery" – via Vimeo. Wikimedia Commons has media related to Trappists. Wikisource has the text of the 1911 Encyclopædia Britannica article Trappists.